The Tanglefree Pro Series Full Body Flocked Mallard Combo package combines the most realistic postures commonly seen among mallards in the field. All drakes have flocked heads in order to be seen for miles in dirt and vegetative fields but also removes the unnatural shine that will flare ducks. 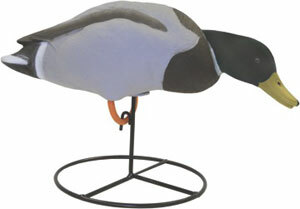 The one-piece body style allows for quicker decoy setup time and eliminates lost or damaged decoy heads between hunts. With advanced paint and flocking colors, a variety of different body styles and greater durability, you are getting a small-spread field frenzy in a box. 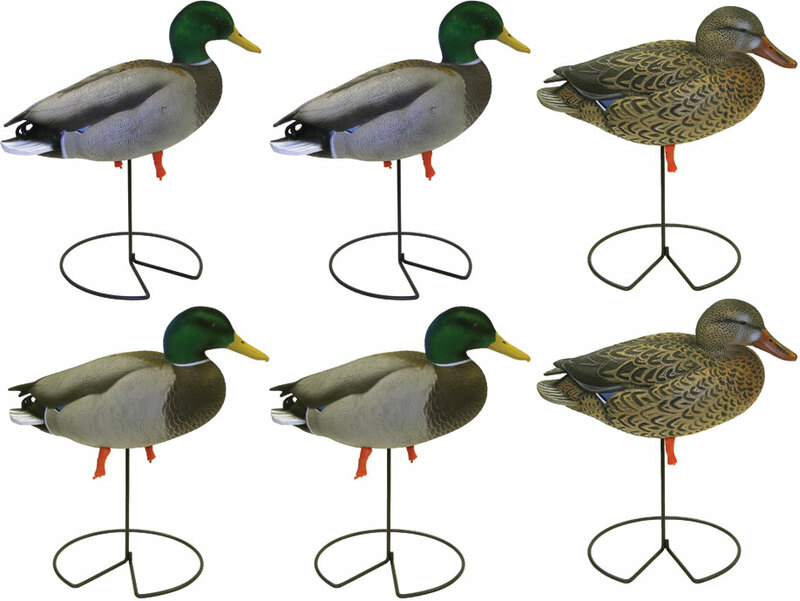 • Size: Feeders 19.5", Uprights 18"
Created by Master Carver Don Mintz, this collection is lifelike and spot on in posture and paint making these full body mallards the perfect addition to any field spread. No more searching in the dark for lost heads, the one piece design makes setup and take down a breeze. Comes standard with "Run n Gun" field stakes and round bases. Created by Master Carver Don Mintz, this collection is lifelike and spot on in posture and paint making these full body mallards the perfect addition to any field spread. No more searching in the dark for lost heads, the one piece design makes setup and take down a breeze. Comes standard with "Run n Gun" field stakes and round bases. Packaged 4 Upright Drakes and 2 Upright Hens per 6 pack. Whether you need confidence decoys around a blind or are hunting ducks feeding in a field, the Pro-Grade Full Body Mallard is the decoy for you. 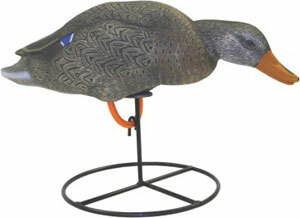 This decoy utilizes a one-piece design, RealMotion II system with motion stakes, and is true life-sized. Drakes have flocked heads for exceptional realism! 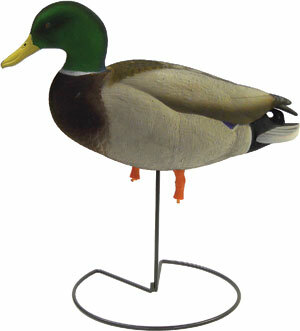 Includes 4 Drakes (2 Stretch Neck Feeder, 2 Searcher Feeder) 2 Hens (2 Feeder) per 6 Pack. Whether you need confidence decoys around a blind or are hunting ducks feeding in a field, the Pro-Grade Full Body Mallard is the decoy for you. This decoy utilizes a one-piece design, RealMotion II system with motion stakes, and is true life-sized. Drakes have flocked heads for exceptional realism! Includes 4 Drakes (2 Walker, 2 High Head) 2 Hens (2 Content) per 6 Pack. Whether you need confidence decoys around a blind or are hunting ducks feeding in a field, the Pro-Grade Full Body Mallard is the decoy for you. 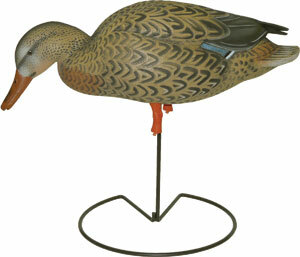 This decoy utilizes a one-piece design, RealMotion II system with motion stakes, and is true life-sized. Drakes have flocked heads for exceptional realism! Includes 8 Drakes (2 Walker, 2 High Head, 2 Searcher Feeder, 2 Stretch Neck Feeder) 4 Hens (2 Content, 2 Feeder) per dozen. 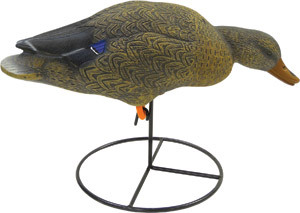 Whether you need confidence decoys around a blind or are hunting ducks feeding in a field, the Pro-Grade Full Body Mallard is the decoy for you. 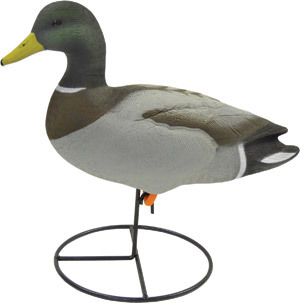 This decoy utilizes a one-piece design, RealMotion II system with motion stakes, and is true life-sized. Fully flocked body for exceptional realism! Includes 4 Drakes (1 Walker, 1 High Head, 1 Searcher Feeder, 1 Stretch Neck Feeder) 2 Hens (1 Content, 1 Feeder) per 6 Pack. The latest creation of field decoys from Avian-X, the new AXP Over-Sized Full Body Mallards are without a doubt the leader in the category. True to life postures of a feeding flock of mallards has been created at the hands of World Champion Carver, Rick Johannsen. 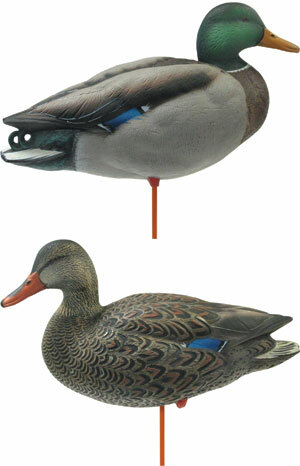 Paint schemes were also created, not only to look like the real bird but also to create contrast in the dark and light colors of the duck, this allows the decoys to be seen from a greater distance in a variety of field conditions. AXP Field Mallards are built to last, molded from an advanced rubberized molding material and non-chip paint. 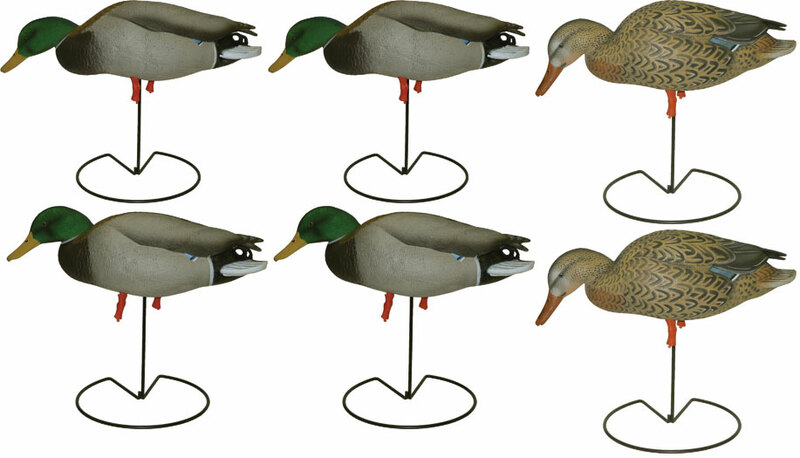 Decoys are available in Pairs and in 6-Packs that include 4 drakes (1 low-head, 1 stretch feeder and 2 feeders) and 2 hens (1 high-head and 1 stretch feeder). 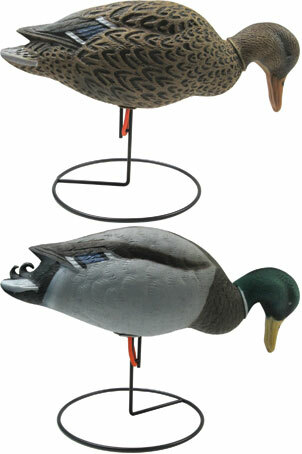 Decoys feature a wind activated motion system that rest atop a heavy duty 17" field stake. 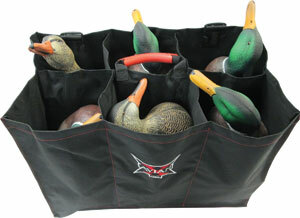 The 6-Pack also includes a heavy duty 6-slot decoy bag that will keep your decoys organized and clean for years of use. 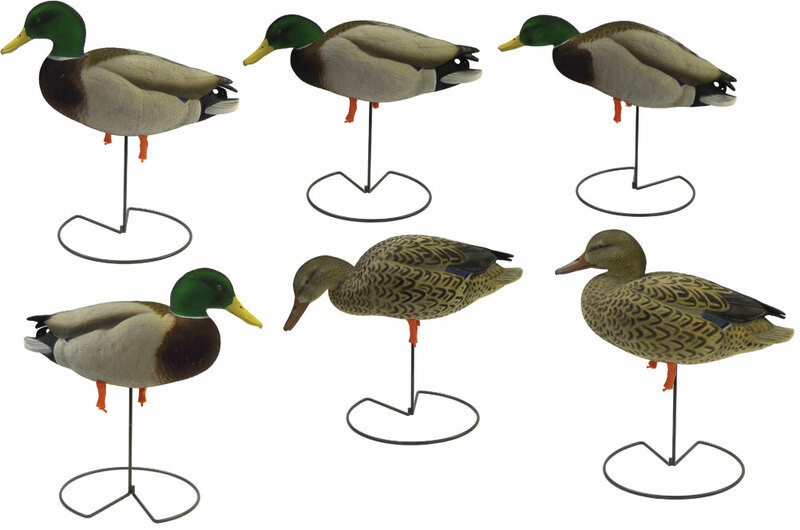 Flambeau Storm Front Full Body Mallard Duck Decoys will help you be more successful in the field. 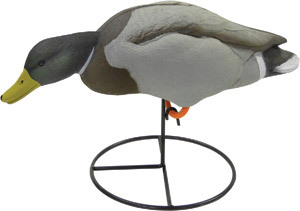 This full-body decoy is oversized and features winter plumage for maximum visibility in field situations. 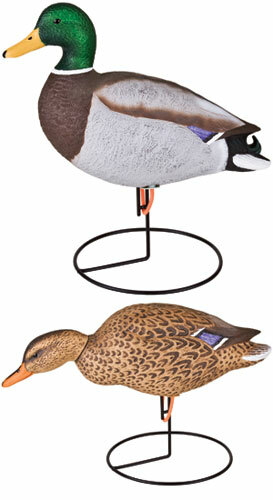 The rotating heads on the Storm Front decoys allow you to add versatility to your spread. A revolutionary motion stake allows you to set the decoy for up to 40 degrees of rotation or lock it in a fixed position on extremely windy days. 6 Decoys Per Carton. 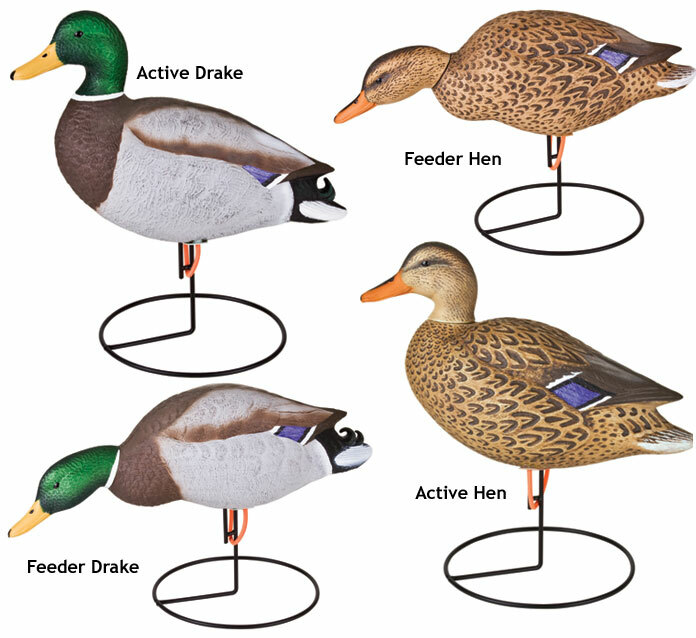 4 Body Styles Per Carton: (1) Full Body Active Hen, (1) Full Body Feeder Hen, (2) Full Body Feeder Drakes and (2) Full Body Active Drakes. Only Drakes come with Flocked Heads. 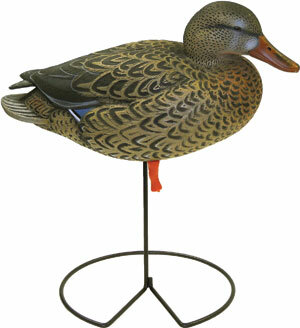 Full Body 18" Each decoy is created using UVision paint. UVision is the only paint system in the world that matches the reflectance of feathers in the full range of light visible to birds, including ultraviolet (UV). 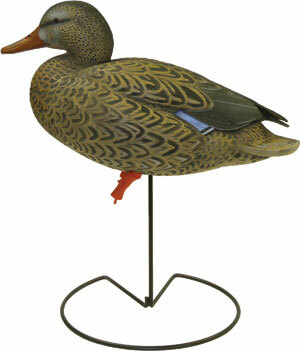 Flambeau decoys are now the only decoys available with colors that look correct to birds. Order now and plan for a successful hunt. 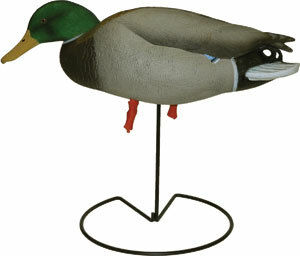 These Mallard Full Body decoy heads are molded in metallic green material for permanent color. Custom manufactured in the U.S.A. using domestic flyway body styles. Molded, high-impact plastic for lightweight durability. Specially treated surface for maximum paint adhesion and longevity. Authentically hand-painted with natural bird colors for exceptional realism. Non-glare paint. Raised feather detail and realistic acrylic eyes. 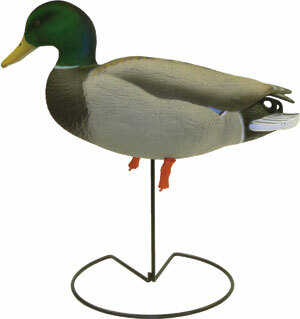 Finally, the full body mallard decoy that we all have been waiting and asking for. 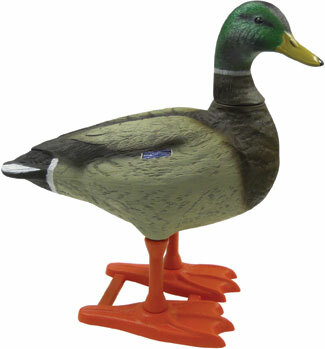 Big Foot has produced a Full Body Mallard with its signature foot design. This means no wire bases, no broken bands, just simply pick up your decoy and place it in your field layout. This decoy is brand new, it is not a goose decoy made to look like a duck, but a brand new mold made in the Big Foot tradition. The decoy comes 4 Drake Sentries per box. The decoy measures 22" tall to the top of the sentry head and 22" from tail to end of the beak and about 9" wide across its back. 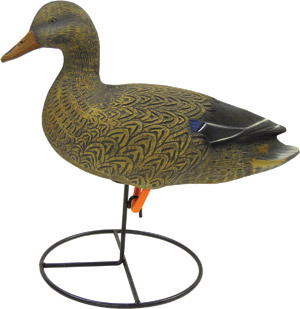 The size of this decoy makes it extremely visible in any field condition. 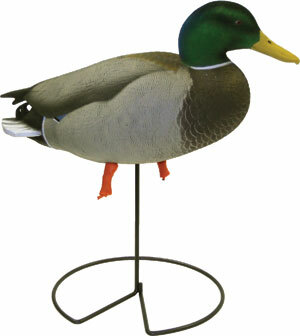 Anyone who hunts ducks in the field will be amazed at what these decoys have to offer.